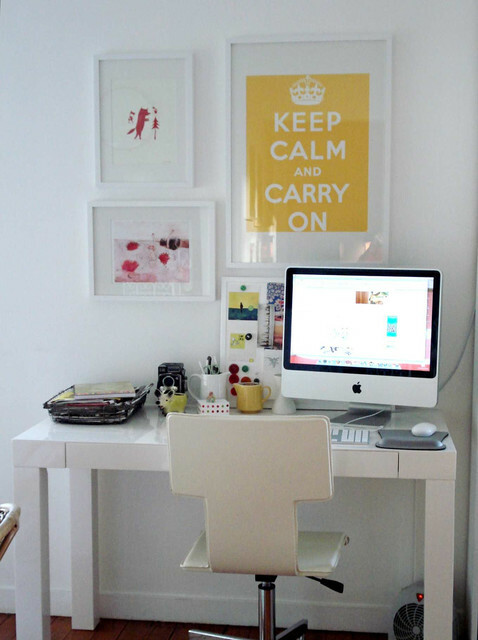 This Simple set up for the home office desk space moves the desk away from the blank wall to looking out at the view. Reconnecting to the outside while working maybe all you need to change for better positive thinking. A Sleek Parsons table in a lacquered bone finish is accompanied by a comfortable upholstered dining chair. This gives a casual approach so that you could incorporate a more multi-purpose function yet still has a decorative feel. However, if you plan to spend more than an hour at your desk at a time, invest in an ergonomic desk chair, but for sorting out your bills, checking your emails and what not, this may be right for you. Categories: Home Office | Tags: Computer desk, Desk, Furniture, Home Office, Office Products, Optimism, Parsons table | Permalink.